Portable dash mount with non-skid material design keeps your device securely in place with no hardware or adhesive mounting necessary. Weighty, non-skid mount design conforms to your dash's contour for a sleek look and solid fit. Fully portable for use in multiple vehicles. 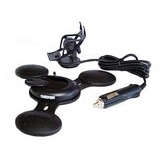 Includes friction mount, cradle and 12/24-volt vehicle power cable.